It is said that music is the life blood of any society… and especially if you are an African you are termed to be a slave of the rhythm of music. Before I sat down and put a limelight on him, I remembered vividly how I came to meet this guy, it was back in his high school days, there was some music clinic as it was called and he had just arrive from a rugby game since you could see his panting and worn out body hurrying to the music the music room. He was instructed to do some improvisation of some music which he nailed it quite tremendously well without an objection, with the finish of the last note you could tell he was a maestro to be. He is known as Paul Asiyo commonly but his true identity is Paul Sitnam Asiyo. He is just 20years. He is a criminology student at CUEA (Catholic University of Eastern Africa); his choice of career speaks volumes of how good he is in capturing your attention to pin drop silence. He started his music love affair not long ago while still in high school, in Nairobi School. He specialized in playing the tuba. 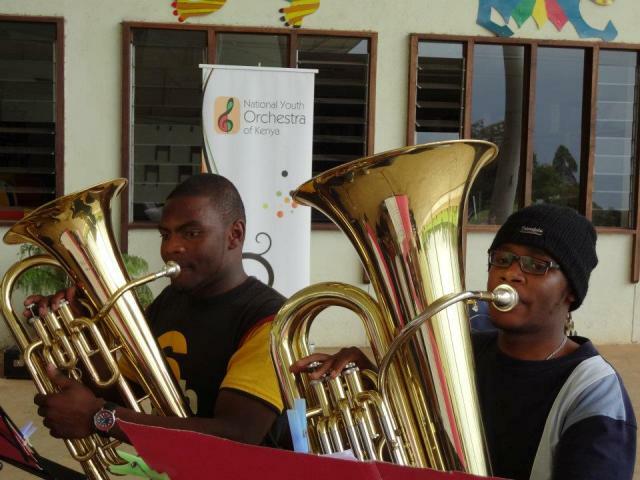 After his completion of high school, he joined and became a member of the National Youth Orchestra, besides being a musician and a performer, he dedicated his noble time to give back to the community his well learned talent and teaches at Nairobi school music during his free time. Paul still claims that he owes nothing but to God and his loving support from family and friends. He also added that he is still not there yet, we are yet to watch his space, he looks up to a lady known as Jennie Moore I guess a renowned tuba player as well. However, still his boyish nature in him is quite obvious he loves football and his never ending love for Liverpool football club. YOU NEVER WALK ALONE. (YNWA) and anime manga, which in particular he loves bleach and the main character Kurosaki Ichigo. Parting shot: He ended by this quote: God does not give you people you want but people you need, those who love you, hate you, despise you, those who support you too and others who look down upon you, so that by the end of the day this people will really make you the true person you are destined to be.